Sharon Bhagwan Rolls is a second-generation Fijian women’s rights advocate working at the intersection of gender and media. 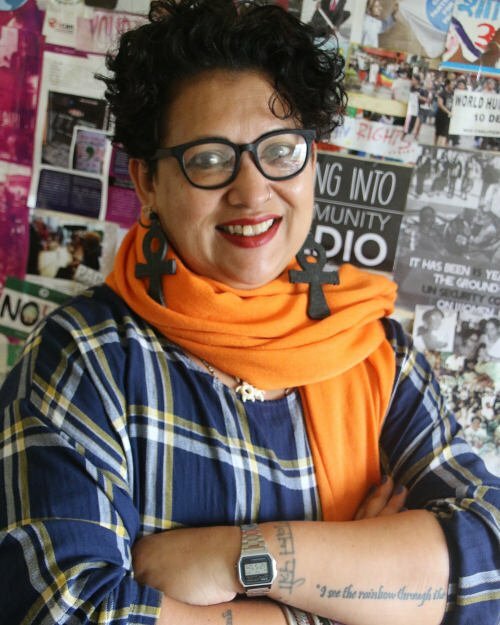 Following a successful high-profile career as a radio and television producer and presenter in Fiji, she helped establish femLINKpacific in 2000 as a regional women-led media organisation that advocates for Pacific women as decision makers in the long-term transformation of their respective island countries. In 2004, femLINK launched Fiji and the Pacific’s first women-led community radio station, which has enabled a core group of diverse producers to develop and distribute content on women’s issues through a range of media platforms – today the FemTALK 89FM network broadcasts more than 800 hours a month of radio programming dedicated to gender equality, human security and peace via a 24-hour radio station in Suva and since 2012 the only radio station based on Fiji’s 2nd main island of Vanua Levu. Under her leadership, femLINK has made a strong regional case for progressing work on international commitments to women’s peace and human security; and contributed to the development and adoption of the Pacific Regional Action Plan on Women, Peace and Security. Sharon is passionate about women leading innovation in media and ICT, which has meant tackling the current ICT policy environment in the Pacific to make this sector more enabling and accessible for women. Following Cyclone Mick in 2009, femLINK launched the Women’s Weather Watch, an innovative information communication system that monitors approaching storms and disaster management in communities, provides real-time information with a local touch and advocates for the involvement and consultation of women before, during and after natural disasters. In addition to serving as Executive Producer Director of femLINKPACIFIC, Ms Rolls is the current Board Chair for the Global Partnership for the Prevention of Armed Conflict (GPPAC) and the Co-chair of the Board of Directors of the Global Fund for Women. This portrait of Sharon Bhagwan Rolls was first published by the Pacific Community for the 70 Inspiring Women campaign, it is reproduced here (with some modifications of our own) with their permission.